Sometimes it's best to go back to what you're good at -- Michael Jordan dabbled in baseball before returning to dominate the NBA, while Eddie Murphy dabbled in voiceovers before returning to dominate not being funny in person. 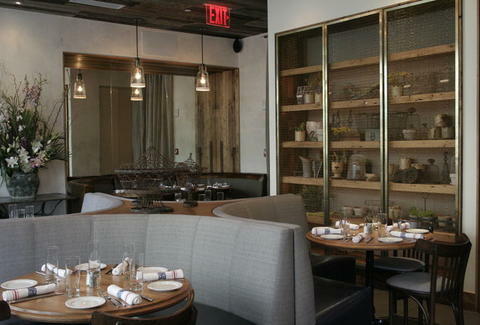 Going back to French brasserie-ing, the chef at Plein Sud, grand open today. From a Daniel alum who was slated to head up Bar Boulud before instead taking a turn at BLT Market, Sud sinks the chef back into the delicious confines of Gallic comfort food, backed by AvroKo-designed French farmhouse touches like gold mesh-covered wooden shelving lined with garden supplies, a florally upholstered ceiling, and banquettes with more weathered, leathery trim than a Real Housewives marathon. Focusing on southern regional specialties, hearty grub starts with five versions of oven baked flatbread (e.g., smoked bacon/ onion/fromage blanc), charcuterie ranging from creamy duck liver mousse to wild boar saucisson sec, crispy frogs legs, and escargot done two ways, which picky eaters will identify as "with snail", and "also with snail". Those continuing their gustatory journey can sup on roast leg of lamb with seven bean fricasse, piquillo pepper, and thyme jus; a Black Angus LaFrieda patty that's stuffed with cheese, topped with black truffle aioli & dropped on toasted brioche; and the smoked tomato vinaigrette'd Roasted Loup de Mer, who has difficulty maintaining a one-man wolf pack what with all the fish in the sea. The kitchen's opening at 6am for breakfast, while a weekend brunch menu'll rock three Benedict variations, a trio of breakfast flatbreads, and sandwiches including a Croque Monsieur, which will gladly dress up like a Madame if you feel like dabbling in being Eddie Murphy.